In a workbook format, Bedford Basics incorporates a streamlined version of the text from the highly successful Bedford Handbook with lower-level exercises. 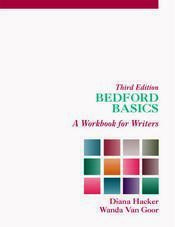 Because Bedford Basics follows the handbook's organization, it can easily be used in conjunction with the handbook in a composition sequence or it can stand alone in any developmental writing class. For the new edition, the exercises have been carefully revised after much classroom testing. In addition, several new features have been added to make this book more useful for culturally diverse students, students working on a computer, and students using the book on their own.